Located around 200-300 kilometers from the coastline of Kerala, Lakshadweep is a classic coral atoll. This archipelago is the set of 39 striking islands that have rapidly become a preferred destination for nature admirers and adventure enthusiasts. The unfathomed beauty of the islands offer landscapes that bind the wits of travelers in the search for serenity far flung from the hustle and bustle of city life. There is offered a plethora of water sports in Lakshadweep Islands satiating the adrenaline rush in the adventure aficionados. This 5-day trip will take you close to the nature's opulence of the Lakshadweep Islands. The trek will start from Cochin and from there you will fly to the islands. This tour comprises exploring Bangaram, which is the only atoll in the archipelago where alcohol consumption is permitted. The lagoons are as azure as they can be and the corals flicker! 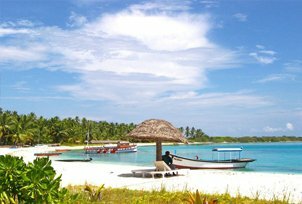 Lakshadweep offers paramount holiday value and the sandy beaches are creamy white with lush coconut and palm trees. The archipelago promises to leave you fascinated, and is without a doubt one of the unsurpassed tropical experiences India can tender. On arrival in Cochin, our representative will transfer you to your pre-booked hotel. In the afternoon, we will take you for a city tour. An overnight stay at the hotel. Today, we will transfer you to the airport to catch the flight to Aggati. On arrival in Aggati, we will transfer you to hotel. Enjoy an overnight stay at the hotel. The day is fixed to relax at the beach or enjoy water sports. An overnight stay at the hotel. The day is free to enjoy water sports or simply relax at the beach. An overnight stay at the hotel. Today, we will transfer you to Aggati airport to catch the flight to Cochin. Thereafter, you can proceed to your onward destination from Cochin.